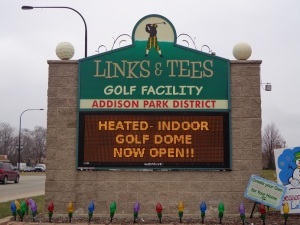 LINKS & TEE’S GOLF DOME ON LAKE STREET ADDISONPARKS.ORG. CALL (630)-233-7275 EXT 4 FOR INFORMATION Friday night country themed music to hit by starting soon in January. Customer appreciation day January 31st. 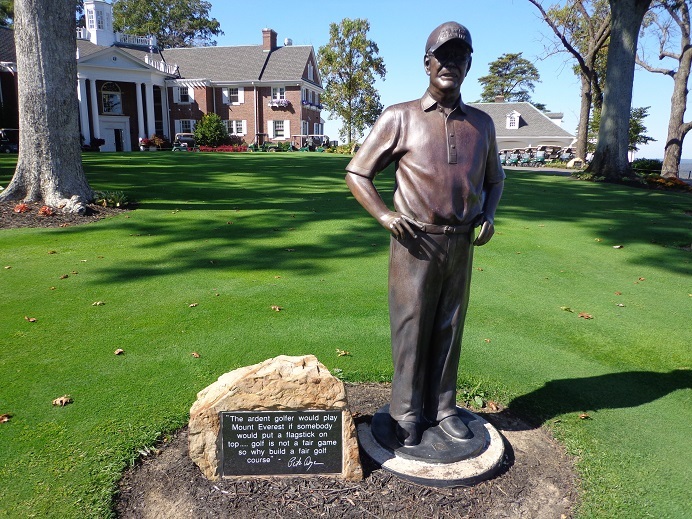 It’s not far from the famed French Lick Resort, in fact just over 30 minutes away. 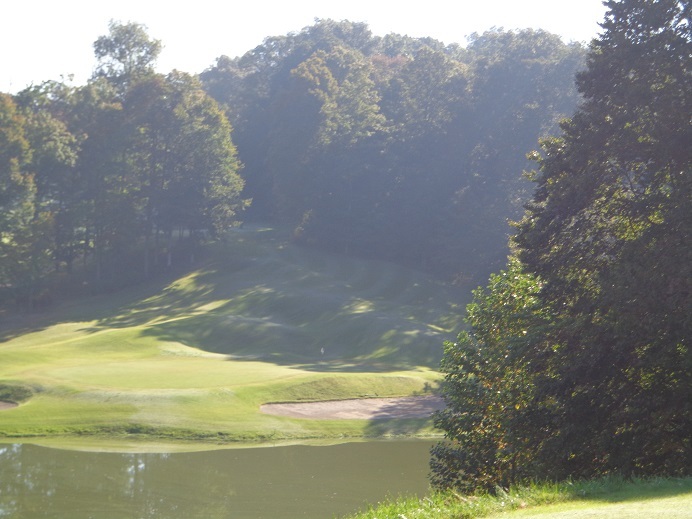 While the management agreement between the two properties might be expiring, it’s still great golf all in the same area of Southern Indiana. Welcome to Sultans Run Golf Course. Jasper Indiana is not a far drive from French Lick Indiana. 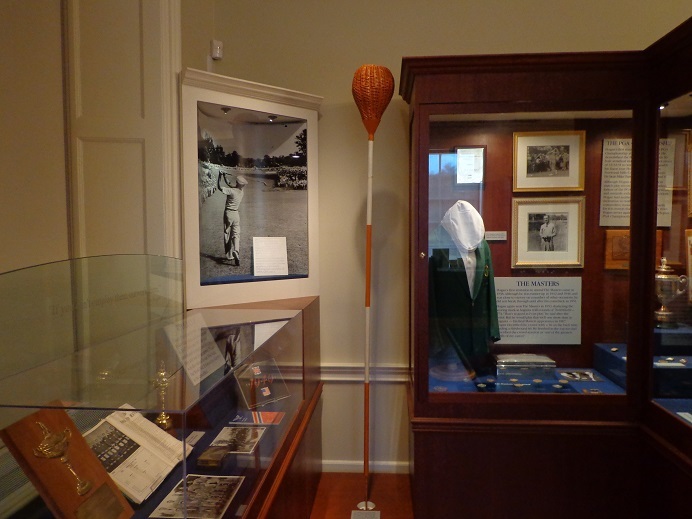 Jasper might not be home to a famous basketball legend like French Lick is, but both town have one thing in common and that’s great golf. 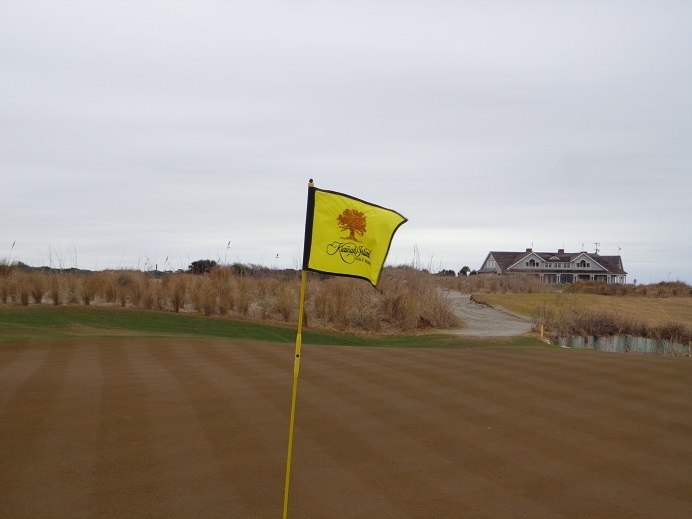 Jasper might only have one golf course, but that’s okay because it’s a pretty good one and golfers who have been there keep coming back. 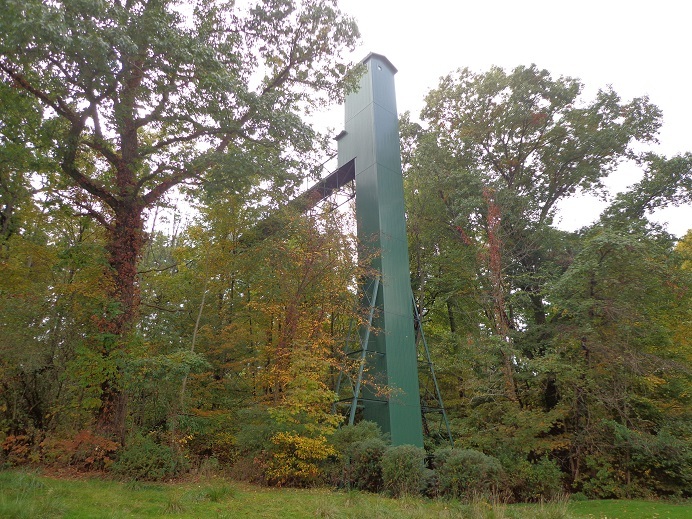 Sultans Run at one time was a horse farm. It was home to a horse called Supreme Sultan, that has some history behind him. Over the land that now comprises 18 holes of golf and a driving range, Supreme Sultan sired a record amount of World Champion American Saddlebred horses. Nobody else can claim this record. 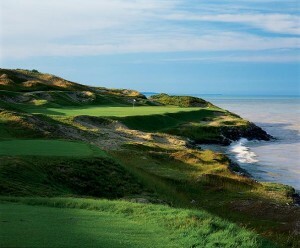 THE PAR 3, 2ND HOLE REQUIRES A CARRY FROM THE TEE. 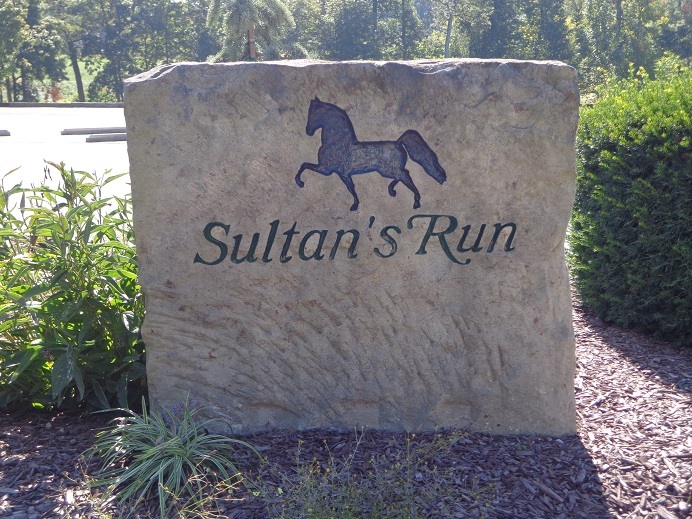 If your curious about who some of the horses are who got their start in life right at Sultans Run, you need check no further than the engraved stones around the tee boxes to see the names. The property underwent a renovation in 1996 by architect Tim Liddy who broke into golf design under the watchful eye of Indiana’s very own Pete Dye. 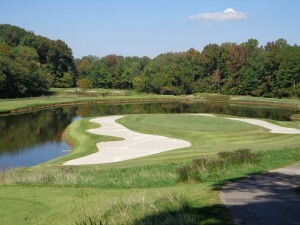 Sultans Run has had new bunkering, re constructed greens, and a reworking of a few holes over the years. What it is now, is one of Indiana’s best public golf courses. 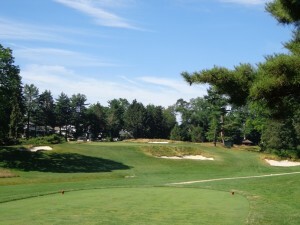 The par 3, 12th hole has water long and left. Liddy has created several challenges the golfer will enjoy. The first hole is a straight out par 4 that helps you get the round going, but the second shot is uphill. The second hole requires some carry over water into a green snuggled into the side of a hill. 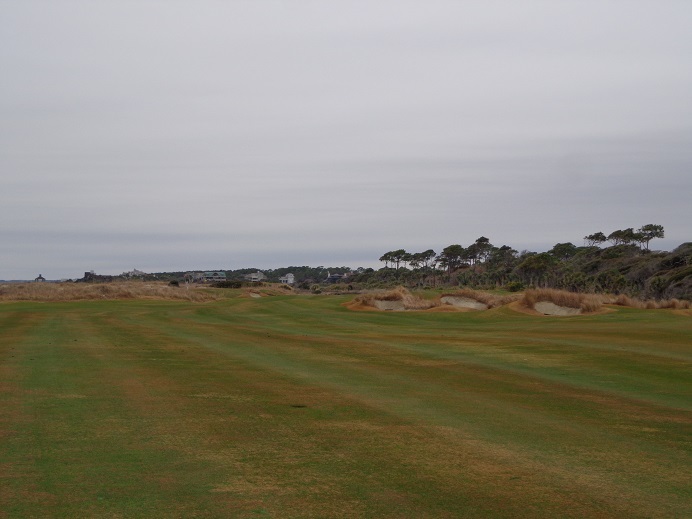 The rest of the front nine will give you more elevation change and a series of doglegs, including the short (493 yard) par 5 that plays Left to Right but has an uphill long second shot to get home in two. 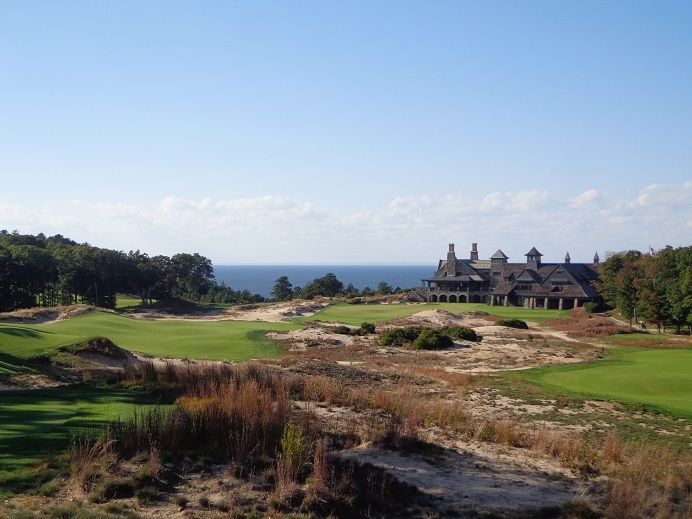 The back nine opens with a solid 576 yard par 5, that makes you think how much of the corner you want to cut off with your drive. 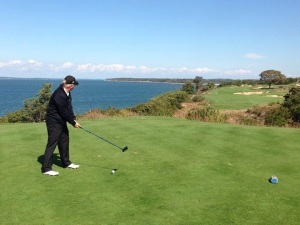 The Par 3, 12th hole plays around 200 yards from the back tee’s, with water long and left. the last par 5, of the day is the 13th hole. It has a strategically placed creek and traps, that make this gradually uphill hole play tougher than it looks. The par 3, 16th hole is 192 yards from the Tips. No golf course that is built on a former horse farm is complete unless, it has a horseshoe shaped bunker. 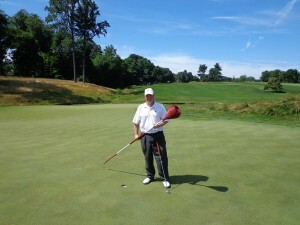 At Sultan’s Run this is found on the par 3, 16th hole that plays 192 from the back tees. If you fly the green and the horseshoe you will find the pond. While Donald Trump did not design the final hole at Sultan’s Run, you do get a finish that you might find at one of his courses. The waterfall behind the 18th green not only gives you a pretty finishing approach shot, the sounds of the water can be soothing as you stand over your final putt of the round. 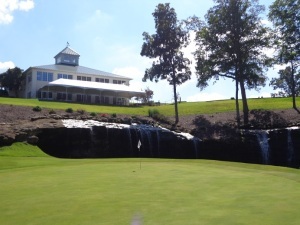 The 18th green with full waterfall behind. 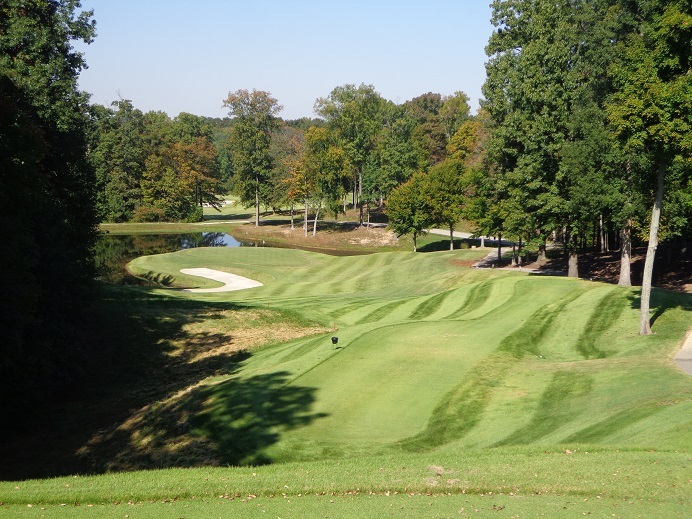 Sultans Run is doing some remodeling so they can not only help golfers have a great round, but giving your group the setting for you 19th hole activities. Have a big group and small group, need the right spot for a wedding. No problem Sultans Run can handles your requests. 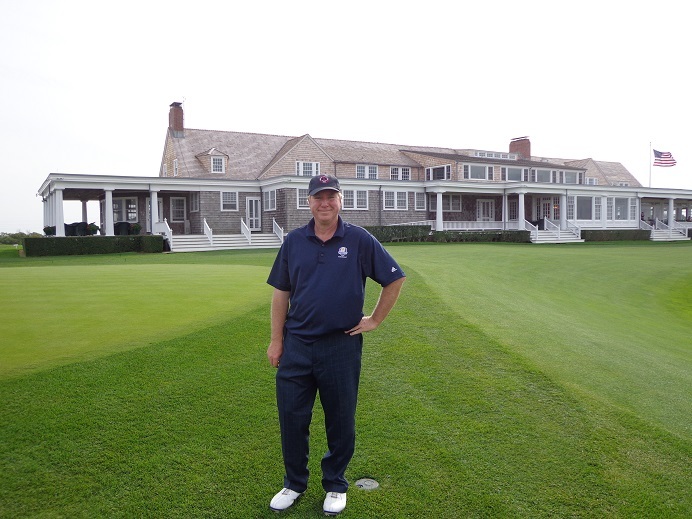 If you GPS on the golf course, you can even download the App to your phone. Sultans Run should be on your hit list if your headed through Indiana, just over 1 hour from Churchill Downs if headed down to the Kentucky Derby. Call (812)-482-1009 for tee times, or visit the website and book online at SultansRun.com. 1490 N. Meridian Road in Jasper, Indiana. THE BUFFALO GROVE GOLF & SPORTS CENTER, is open today Saturday from 7 AM to 10 PM, rates start at just $12 for 30 minutes. It’s not too late to get the 5 hour pass for $85, or a season membership for $525. 801 McHenry Road in Buffalo Grove call (847)-459-2321 or visit on line Bgparks.org. Customer Appreciation Day is Feb. 7th from 11 AM to 2 PM. 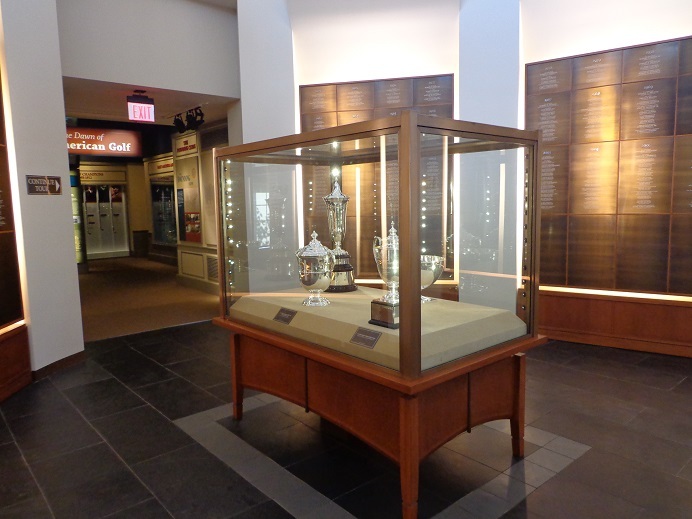 In the Chicago area golf fans would love to see the PGA Tour be in town every year, but since the Fed Ex Cup Playoff’s have been around the BMW Championship has stayed on the move and in 2014 that was the case again. 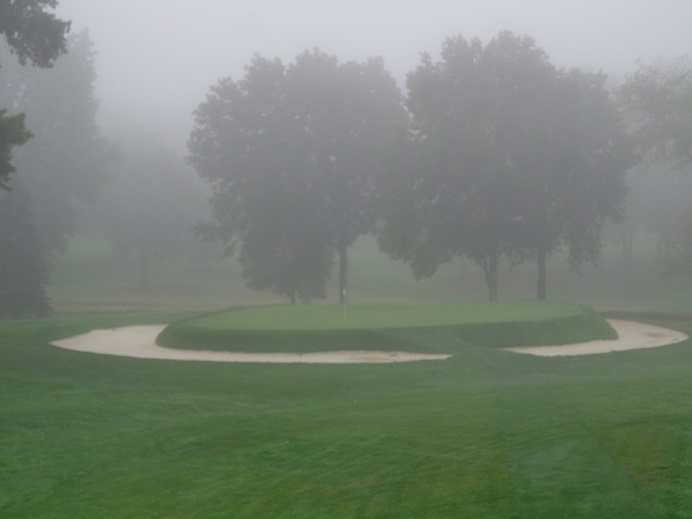 In 2008 the BMW Championship drove off to St. Louis, in 2012 it went over to Indianapolis, and now the Denver Colorado area in 2014. This next year in 2015 the championship will return to the newly revamped Conway Farms in Lake Forest. But now with the final numbers in for 2014, the picture becomes a little more clear why the championship stays on the move. The picture is more than Black and White like the color of some BMW models, it is green like a golf course and the color of cash that it takes to keep some 800+ Evans Scholars in school. The 2014 BMW Championship played at Cherry Hills Country Club and won by Billy Horschel, poured a record amount of $3.5 million dollars into the coffers of the Evans Scholars Foundation. That will keep a lot of scholars hitting the books at various schools mostly around BIG 10. This past September over 125,000 spectators poured into Cherry Hills to see the BMW be played in the state of Colorado for the first time. 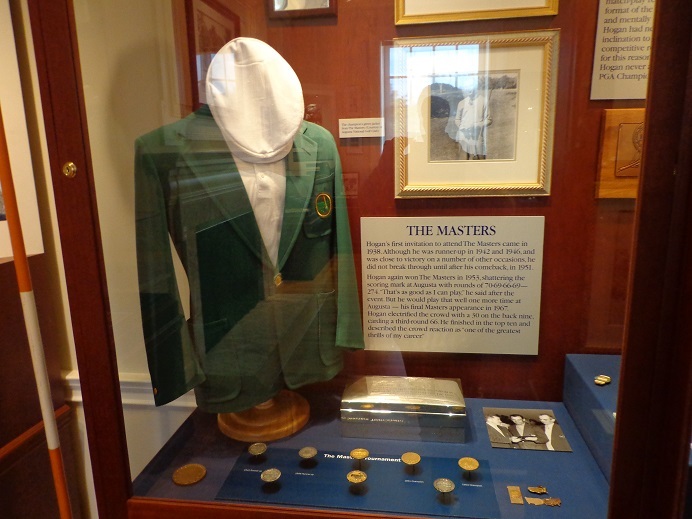 The $3.5 million broke the record amount raised in 2008 at the Bellerive Country Club in St. Louis, that figure was $3.4 million. Since BMW came on board in 2007, they have helped raise $ 19.6 million dollars for the Evans Scholars Foundation. 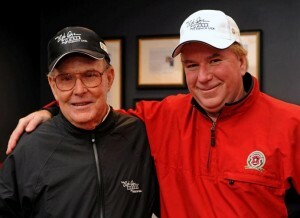 The PGA Tour has named the Evans Scholars Foundation as one of the five finalists for the 2014 PGA Tour Charity of the Year Award. 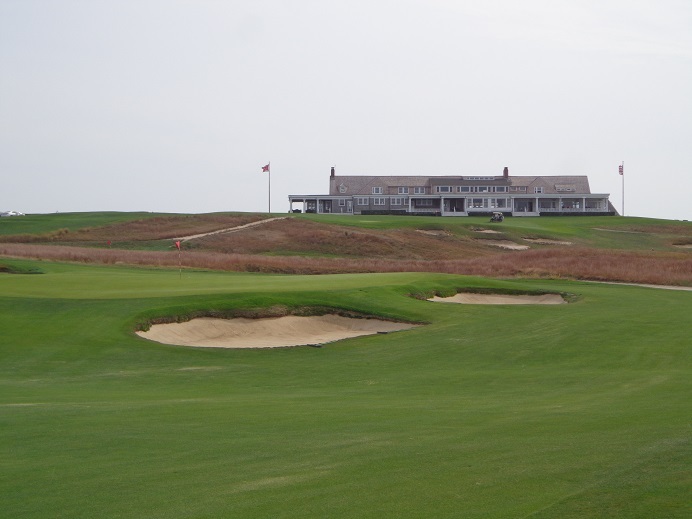 The 2015 BMW Championship will be played from September 14th thought the 20th at Conway Farms Golf Club, in Lake Forest Illinois. 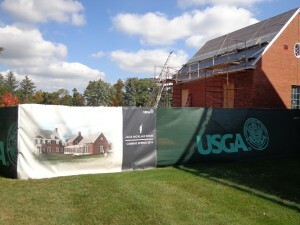 Where Illinois golf fans will have the chance to break the $3.5 million dollar record raised for the scholars. The Links and Tee’s Golf Dome is located on lake Avenue in Addison Call (630)-233-7275 Ext 4 for more information or see addisonparks.org. I know you are in a hurry to test out those new golf clubs. I can’t say I blame you. Your headed somewhere warm for New Years eve and your taking the clubs, that is a great idea. Your starting that New Years resolution early and getting some exercise, that is a great idea as well. 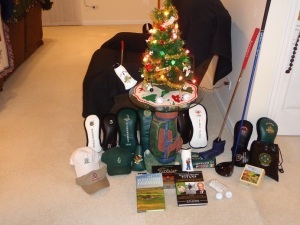 Bottom line is you are ready to hit some golf balls while you have a few days off from work, this week or next week. Well there are several domes you can visit, and the Gog Blog is here to make sure you know the holiday schedules so you can go hit the dome over the holiday break. In Buffalo Grove at the pride of Lake County. 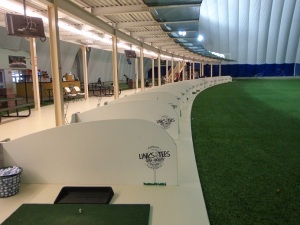 The Buffalo Grove Golf & Sports Center. 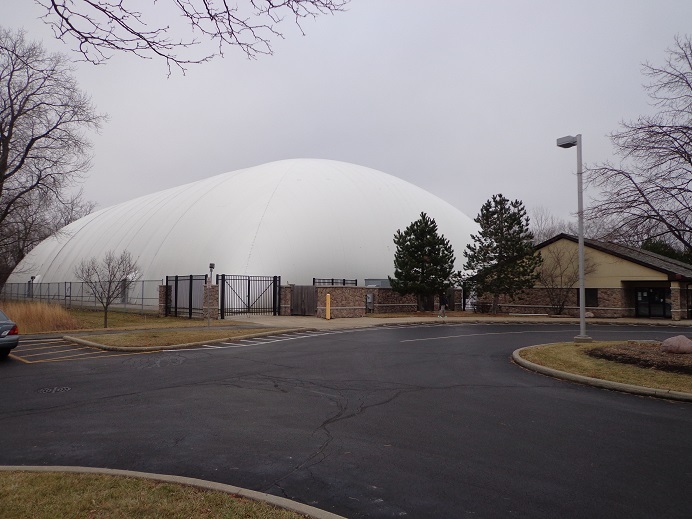 The award winning Buffalo Grove Golf Golf & Sports Dome will be open on Christmas Eve from 9 Am to 2 Pm and is closed on Christmas Day. 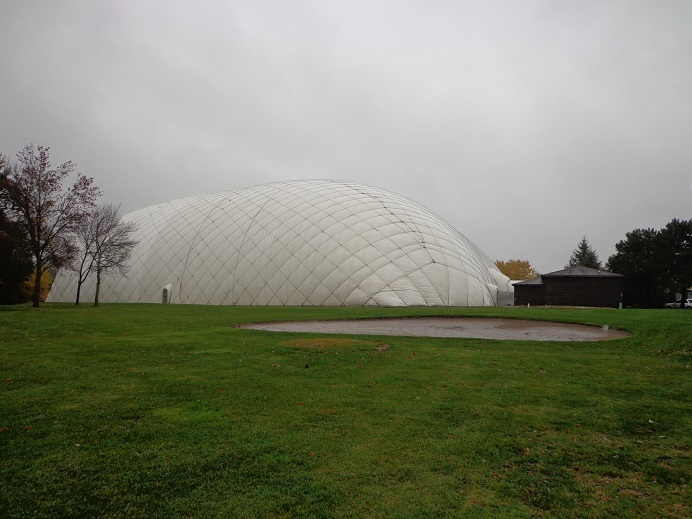 The dome will reopen on Friday at 9 AM, and will open until 10 PM on Friday night. New Years Eve hours 9-2 PM. 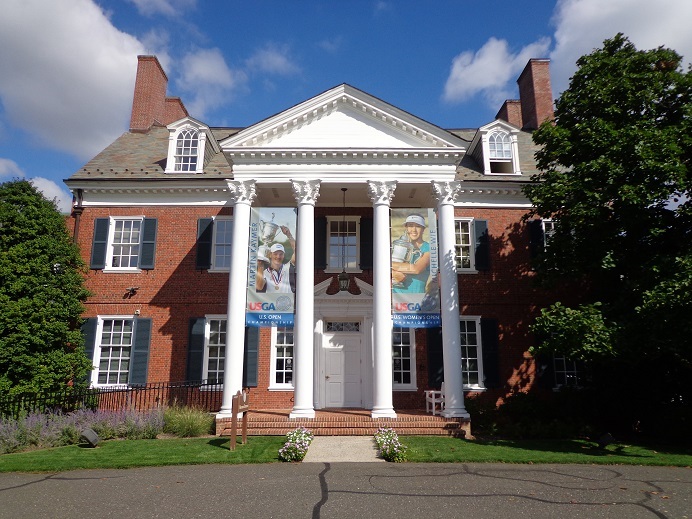 Closed New years Day, regular hours return on Jan. 2nd. (847)-459-2321 and visit bgparks.org. Links & Tee’s Golf Facility on Lake Street in Addison. Holiday hours are 8-4 PM on Christmas Eve, Closed on Christmas Day, normal hours on the 26th 8 AM-10 PM. For New Years Eve, 8 AM to 4 PM, New Years Day Open from 8 AM to 10 PM. For more information see addisonparks.org. or call (630)-233-7275 Ext 4. MCQ’s Dome in Bolingbrook an official Blackhawks bar as well. Is Open on Christmas Eve until 5 PM. Closed on Christmas Day and reopens at 8 AM on the 26th for normal business hours. On New Years Eve, open until 8 PM. Reopens on New years Day at 8 AM (see NHL Winter Classic there) and normal business hours on Jan. 2nd. For more information see MCQ’SBAR.com. or call (630)-739-1592. The White Pines Golf Dome in Bensenville, that is now operated by KemperSports Management, is open on Christmas Eve from 7 AM to 4 PM but unlike past years will now be closed on Christmas Day. On New years Eve the dome will be open from 7 AM to 5 PM and will open on New Years Day from 7 Am to 11 PM. 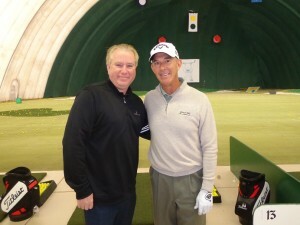 Sight seen at White Pines Golf Dome, Champions Tour Golfer Chip Beck dropped by and gave some lessons. 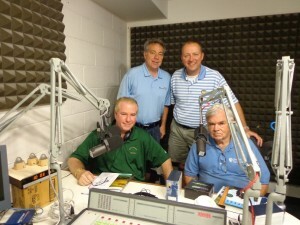 You never know who will be at the White Pines Golf Dome, so call (630)-422-1060 or visit whitepinesgolfdome.com. All of the domes will have equipment companies coming out soon for demo days, so stay clicked in at the Gog Blog for all the details. Follow us on Facebook and Linkedin under Rory Spears or on Twitter @GogBlogGuy.